In suburban areas, where the central water supply -rare, the main source of water is a common well. And as it usually is based on the mind, becoming prominent element in a holiday landscape, you want to see the general background of the structure looked harmoniously. Decorate and give the aesthetic appearance of the structure is simple. The main thing - to decide with the style and materials, because the design of the well at the cottage must start from the design of buildings and the rest of the site. What types of wells are constructions? 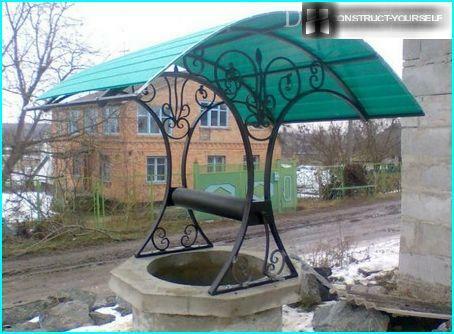 Two types of wells is most often found on the Russian dachas: Russian and shadoof. This type represents the mine from whichwater is lifted to the surface by means of pillars fixed to the drum. He tied a chain with a bucket, and the side has a handle for winding and unwinding the chain. Shadoof less common type of well, althoughpast centuries it was almost every Russian Compound. 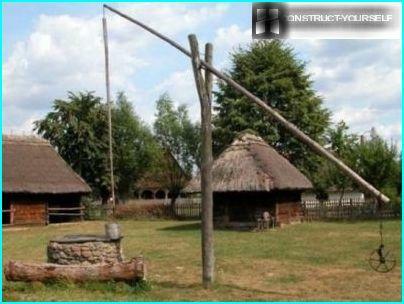 It is used in cottages, where ground waters are close to the ground. It is a shallow pit, from which water take out with the help of a crane. Very rarely in country houses there Abyssinian wells. Before you draw well in the country,estimate, with which you will complete it: with the design of the house or the styling area. 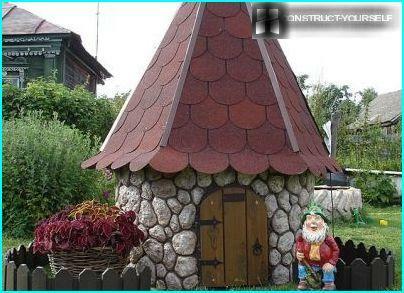 It happens that the owners will build wooden cottage, Russian style, and create a landscape in Japanese. In this case, proceed from the well location, if it is close to home - create a design that is similar to the basic structure. If hidden away in the garden, then the "Enter" in its overall landscape picture. 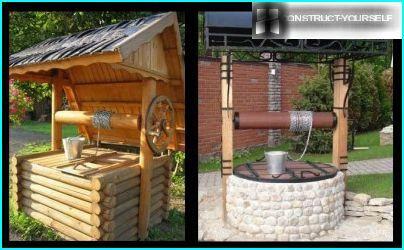 Rustic traditional materialsserve wood and stone, so it is logical to add them to the design of the well. 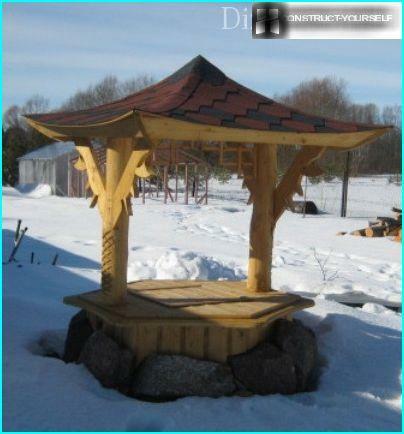 Thus, the well head (the part of the well, which is located above the ground level) can be made from a single plank in a shed or cabin. suitable rectangular or hexagonal design for simulation framework. 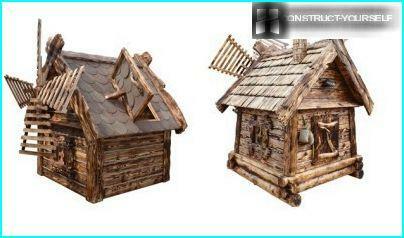 The wooden sheds can be only the lower part and the rack, and the roof is better to use the material, which is covered cottage. 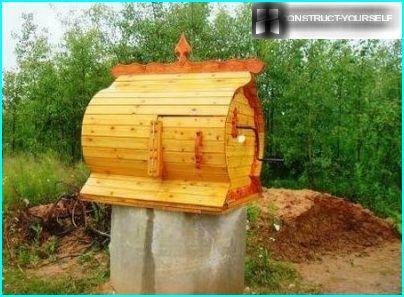 If a country house is in the form Russiantowers and huts with carved shutters, then the well can give a fabulous appearance, performing stand of the dried and peeled bark of the trunks, and next on a bench seated cat carved from wood, bear and even Baba Yaga. Around the tip can lay out a platform of gravel and put in a circle "village" Flowers: petunias, marigolds, zinnias. 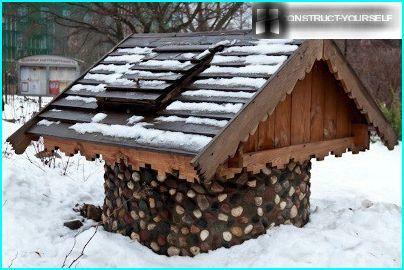 If the villa is built in a chalet style, the decoration should be more stones. In this case, the well head decorated with round cobblestones, pouring it around the concrete solution. Oriental styles are often found in suburbanareas, because the harmony of the landscape and minimalism is very impressed by the outdoor recreation. 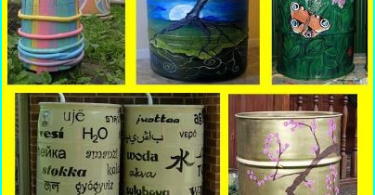 Rock Garden, a dry brook, fountains and waterfalls, lanterns ... And if the well has a place in this environment? There, with a well in Eastern cultures plays an important role of the energy source of the keeper, supplying the manpower for its purity and transparency. The Japanese are very sensitive to water, sowell in the Japanese style is required to provide a canopy that protects the life-giving water from dust, leaves and "evil eye." 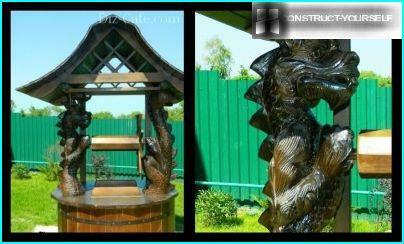 Chinese-style welcome figures of mythical creatures that will protect the well. 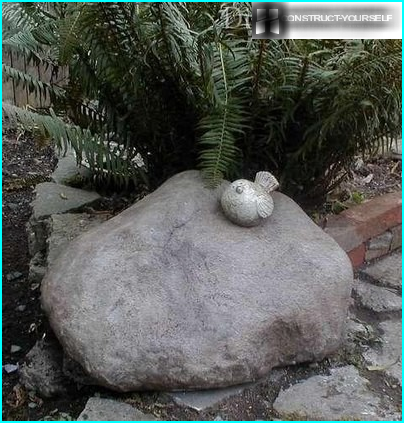 Materials in oriental style - only natural: tree, large stones. The roof has a distinctive, with his form at the edges and often finished with a soft tiles, follows the curve of the roof structure. The design of the holiday well in eastern and include plants. They should be evergreen and the majority of conifers. Very good option - mountain pine, juniper, different varieties of tui. If the villa is decorated using a siding,decorative plaster and other modern materials, it does not make sense to create an old well, because he does not fit into the overall landscape. In this case, make the present and here, stoned concrete ring flat-top floors and the roof is made from a sheet of polycarbonate. Racks suitable iron, with elements of smithery, and if not there a blacksmith, you can lay out of red brick. Very often in the cottages you can see images of the wells, which are not clearly defined style, so suited to any landscape. This well very appropriate next to the bathhouse. 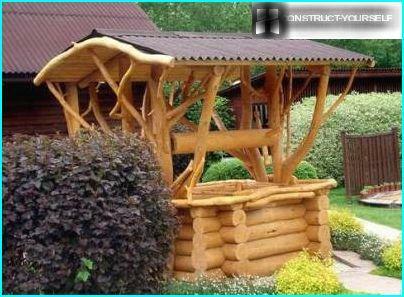 The basis for the pillars and the roof can be a tree, but it is necessary to braid with string or thin rope. Headroom is made of wood, which is artificially sostarivayut to give the kind of seas battered the ship remains. Top on the boards nailed anchors, marine animal shapes hang seashells. Bucket replaced beer barrel and the handle is converted into the steering wheel. 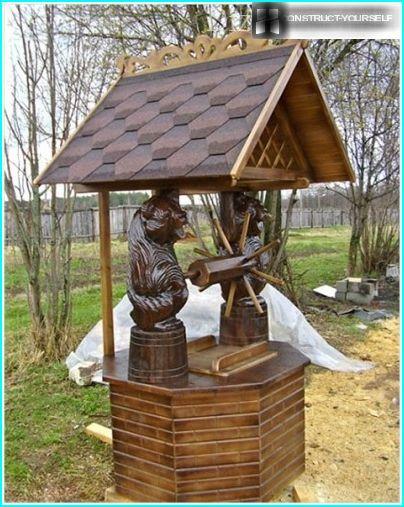 It is made usually of wood, in the form of windmill with four blades. Some craftsmen manage to make the blades moving at high wind. Window inside the tip, where it hides the bucket is placed on the rear side, and the design itself turning vanes to the central garden path. The shape of a miniature house, lined with stone andcovered with cheerful bright tiles, looks successful in the barbecue area. It supplements a composition created by the stove, barbecue, tandyr and other attributes of a good holiday. Moreover, conveniently near the cooking place have drinking water. Thinking how you arrange the well, it is not necessary to rush in search of expensive materials. Use what's left of the main building. Preserved bag of cement - concrete oshtukaturtering and the crude solution of cut brick pattern. When everything is dry - color red-brown paint, and you have a medieval well under the old. There was ceramic tile - break it intopieces and complete the circle tip mosaic, and around the well site - broken bricks or flat-acute-angled stone. Get interesting eclectic. If any of the side of the well have not gottoo well - cover with its flowering shrubs and tall plants (Cannes, trudging roses and so on.). Do not be afraid to dream, because each well and so beautiful that it is unique.